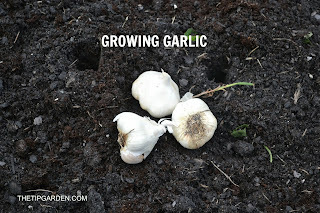 This is part 2 in a continuing series on growing your own garlic. To read the first post click here. At this point you should find yourself in springtime. The garlic has survived the winter. In early fall when you planted it, it developed a root system and sent some green leaves up through the soil. Here's what you need to know to keep your garlic growing as healthy and big as possible. Garlic likes moist soil but not too moist. Too much moisturer encourages mold and plant disease. To check if it is too moist, push your finger through the mulch and into the soil near the root base of a few of your garlic. If the soil is muddy and super wet, then remove some of the mulch to help it dry out the soil. If your fingers come out dry it's time to water. How much water? It depends on how hot and dry your spring is. Usually about an inch or so of water per week is enough to keep the garlic happy, but do not let them dry out too much. Every plant expends only a certain amount of it's energy on growing as a plant. The following tips will help you direct that energy into growing the garlic bulb as large as possible. The leaves that started growing in fall will continue to grow. Keep them trimmed to about 8-10 inches. Any longer than that will inhibit the growth of the bulb. In late spring you should start to see green curly scapes growing from the center of the leaves. Clip these off near the base. 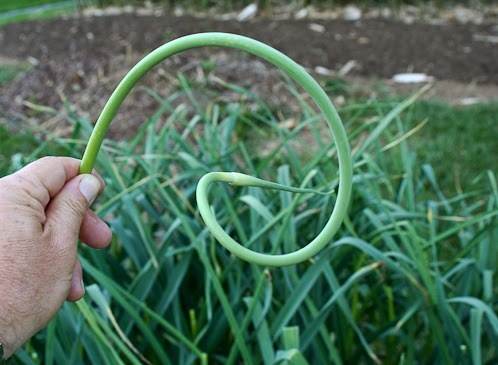 Do NOT throw the scapes in the compost pile. They are not only edible (think the green part of a green onion/scallion) but are delish in your cooking! Just steam or stir fry them and add them as you would the green parts of a green onion! Keep the garden bed weeded as much as possible. Garlic likes to have room to grow and doesn't like being too crowded, so keep those weeds down to keep your bulbs growing large.